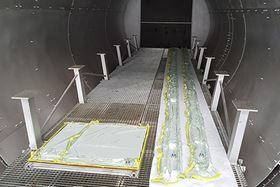 NTPT prepregpanels in the autoclave. North Thin Ply Technology, which makes lightweight prepreg materials, and boat builder Fibre Mechanics, have joined forces to develop composites for boatyards. The companies plan to build structures such as bulkheads, girders and interior joinery panels offsite as prepreg composite panels, made to the specification, shape and size required by the design. While FIBRE Mechanics are responsible for client liaison, specification development, CNC-cut core kit, core insert manufacture, and quality assurance of build, NTPT makes the unidirectional prepreg and the laminate skin preforms at the company’s Polish facility. The core and core insert kits join the preforms in Poland, where the final panels are built by NTPT, under the supervision of Fibre Mechanics. Through the automation of this process, labor time to produce complex parts is reduced, accuracy and high quality of manufacture is consistent and repeatable and supply chains are reduced, the companies say. This story is reprinted from material from NTPT, with editorial changes made by Materials Today. The views expressed in this article do not necessarily represent those of Elsevier.